Dietary fibre can regulate body and cell function. Dietary fibre is the substrate that determines symbiosis and symbiotic evolution. The endosymbiotic archaea regulates human functions and species type and depends upon the colonic archaea whose density is determined by the fibre intake. Populations with low fibre intake have lesser density of colonic archaeal microflora and endosymbiotic archaea. Endosymbiotic archaea contributes to neanderthalisation of the species. Dietary fibre is the substrate for symbiotic evolution. Dietary fibre deficiency related Increased endosymbiotic archaeal growth in the brain leads to perception of low level EMF related to internet use. This leads to porphyrin synthesis which can form supramolecular self-replicating organisms called porphyrions. The porphyrions can form a template for the formation of RNA viroids, DNA viroids, prions and isoprenoid organism which symbiose to form abiogenetic primitive nanoarchaea. The increased growth of archaea consequent to exposure to low level EMF fields in internet users leads to neanderthalisation of the brain producing structural changes in the human brain with prefrontal cortical atrophy and cerebellar dominance. 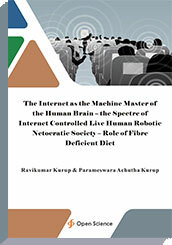 Thus the internet can control and regulate human brain function and can function as the machine master of the brain.